This weekend I am holding my first raw food workshop! I have a bunch of awesome girls coming along and I wanted to whip up something to share with them at the end of the class… not that they will be hungry because everything I prepare they will get to sample and more, but I can’t NOT make them a cheesecake to enjoy at the conclusion of class. Everyone loves a raw cheesecake and I hope they all enjoy this one! Combine all ingredients together in a food processor until the mixture sticks when pressed together. Press base firmly into a round spring-form cake tin. Sprinkling a little extra coconut on the base helps the cheesecake from sticking. Process all ingredients (except the melted coconut oil) in a food processor working you way up to the highest speed setting. You may need to scrap the sides and process again a number of times until the cashews and smoothly combined and the mixture is creamy. (TM: Process working speed up to 10 for 30 secs. Scrap down the sides and process again for a further 15 seconds or until mixture is creamy and smooth). While the processor is running on medium speed, drizzle in coconut oil and process a further 5-10 secs until all the oil to well mixed through the mango filling. 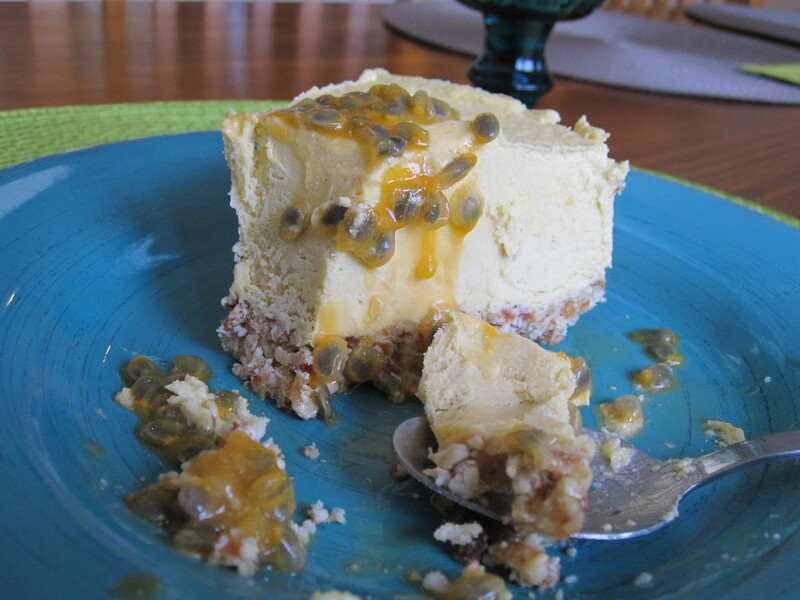 Pour the mango filling over the cheesecake base and set in the freezer overnight. The cheesecake is best cut into slices while still frozen and then allowed to sit at room temperature 20-30 mins before serving. The class and all of the food was amazing today Ali! Thanks so much for a great introduction to raw food. I am very keen to get started on making some raw food very soon. PS Oscar loved the flaxseed crackers and Mike finished off all the delicious pate! Fabulous Fi! As you already know all the recipes are on my blog and most of them I have made more than once – so they do work – if you ever have any trouble – do contact me and I am always more than happy to help. So good that Oscar loves the crackers and Mike likes the pate 🙂 Good luck with the spiraliser too!